As Theresa May invokes Article 50, it may a time for companies to reflect on how they will staff their businesses in the coming years in the face of possible changes in migration and labour laws. One brand that could be at the sharp end of any limitations to foreign workers is Pret A Manger. The company previously said that just one in 50 of its job applicants is British, and is particularly concerned about potential staff upheaval. The chain promoted a ‘big experience week’ – a scheme for 500 UK teenagers to shadow permanent staff members. While it was initially stated that the teenagers would not be paid during their time with the business, this policy was hastily reversed after a fair amount of public pressure. Although it may be too early to ascertain any long term damage the affair may have on the company’s perception, YouGov brand tracking data indicates that the public picked up on the story in its immediate aftermath. Pret’s Impression score (whether someone have a positive or negative impression of the brand) declined by 5 points after the news broke. However, the good news for Pret is that it entered the row in a strong position in terms of perception. Despite the drop its Impression score is still relatively healthy (+14), and places it behind only Greggs (+21) and Costa Coffee (+19) in the sector. This can be attributed not just to the service it offers but its previous CSR work, particularly in relation to the homeless. YouGov Profiles data indicates that Pret made the right move in quickly reverse its policy. Our figures show that approaching four in ten (37%) of the chain’s customers only buy products from companies that have ethics and values that they agree with – compared to just over a third (34%) of the general population. Looking specifically at the issue of the minimum wage, four in ten (40%) Pret customers say the current rate is slightly too low. 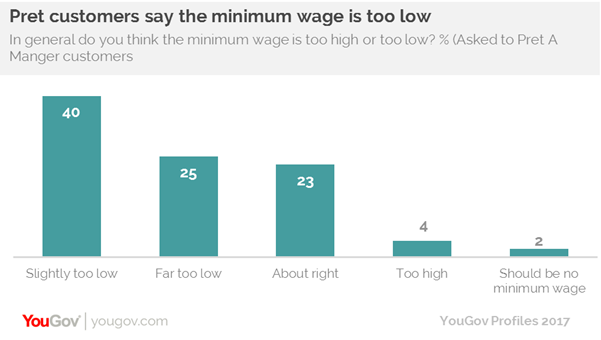 A quarter (25%) believe it is far too low while 23% think it is about right. The brand’s underlying strength should mean Pret recovers from this incident, though it does serve as a warning to other companies looking to plug staffing gaps in creative ways.